Even though no further distilling took place after Tom Delaney's arrest in 1894, the recipe for Delaney's Whiskey was orally passed down in the Delaney family, and was known to have been recited by Pat Delaney (brother of Whiskey Tom) and his son Patrick Michael or PM in the presence of son and grandson Joe Delaney. Alas, the exact measures have passed into oblivion over the years. As well there were rumours of a written recipe but they seemed destined to remain only rumours. Until 'The Complete Practical Distiller' surfaced at the Delaney/Dunne Reunion in Nirranda on 30 December 1978, handed in by Roy Cust 1 of Timboon, who had previously received it from his friend Ned Delaney, the youngest son of Whiskey Tom. He said that it was the whiskey book used by the Delaneys. The cover and the first 14 pages are missing. The book appears to have had a lot of use [some pages are particularly well-thumbed and marked] suggesting that it was consulted often during the production of Delaneys Mountain Dew Whiskey in the 1880's-1890’s. It was written by an American Dr Marcus Lafayette Byrn M.D. [1826-1903]2, graduate of the University of the City of New York, and published by Henry Carey Baird, Philadelphia in 1854. Baird was the leading publisher of technical manuals in his day. Thanks to Glenn Raudins, of Raudins Publishing, who has re-published the 'The Complete Practical Distiller' , we now know that we have at least the 8th edition of the book, published in 1870 and sold at least until 1875, because the Delaney copy has an appendix titled 'Practical Directions for Distilling. From the French of Th. Flinz, Brewer And Distiller' on page 199. Glenn says that this appendix was first published in the 8th edition of the book. There may have even been a 9th edition - a very popular publication, no doubt due to it's exact technical descriptions. "Comprising the most perfect and exact theoretical and practical description of the art of distillation and rectification; including all of the most recent improvements in distilling apparatus; instructions for preparing spirits from the numerous vegetables, fruits, &c. Directions for the distillation and preparation of all kinds of brandies and other spirits, spirituous and other compounds, etc. etc. All of which is so simplfied that it is adapted not only to the use of extensive distillers, but for every farmer, or others who may wish to engage in the art of distilling. " The website of Ulf Buxrud a member of the Single Malt Society, Sweden, lists the title in his extensive whiskey library. 1 Roy does not appear in the Delaney family tree. 'ROY A. CUST, NULLAWARRE' is written in the index on page 215. Another hand has added on the last page 'Given to him by Ned Delaney' . 2 Dr Byrn was a busy man; he had earlier written another book, published by the same house in 1852, entitled 'The Complete Practical Brewer; or, plain, accurate, and thorough Instructions in the Art of Brewing Ale, Beer, and Porter' . He also wrote humourous stories under the pseudonym of David Rattlehead, including 'The Life and Adventures of an Arkansas Doctor' first published in 1851, re-issued by University of Arizona press 1989, and at least one book on medical issues 'Detection of Fraud and Protection of Health' . All in all, an exemplary doctor! - from 'The Delaney/Dunne Reunion 1978' by D.J (Joe) Delaney, pp 4-7. I would imagine that in the dark days (when Delaneys' moonshining forbears were on the job) that the desired affect would have been achieved by making virtually a watery porridge from wheat, barley, maize or whatever, adding yeast for fermentation at the end of which process the liquid would have been boiled in an oversized kettle and the vapour collected by running a pipe through a drum of water to condense it (presumably if the pipe was coiled to some extent that is where the term "worm" would have originated). Today's pot still is only an elaboration of the early days. The principal of putting the spirit through the still twice (for the "coppers") presumably was to give them the stronger brew and still applies as you are building up the alcoholic content by "re-distillation". Malt is used basically in pot stills and produces a heavy (malt) whisky - on the other hand barley (with a little malt) or maize or wheat is used in the Coffey (patent) still and produces a lighter spirit which we cannot by law call Whisky until it is blended with at least 25% of the heavier malt. In over simplified terms the lighter spirit is not unlike the American whiskies which are made majorly from maize (corn liquor) and rye to produce bourbons and ryes, although they introduce more flavour with their process - our grain spirits tend to be fairly neutral. More recently whiskey (rum and brandy) has been stored in oak cases (for maturing to eliminate the harsh, raw taste of new spirit) but I imagine if, under the primitive conditions, the "oldies" were able to make any surplus to their needs they would have "stashed" it on stone demijohns and disregarded the "finer points" of maturation!. At the peak of production, Tom is said to have made 100 gallons a week. It was labelled "MOUNTAIN DEW" and they cheekily put the official Government stamp on it. Mountain Dew was a common drink at local weddings and one day at Koroit races it was the only drink on sale. By the end of the second race, the crowd was said to be in a fighting mood. A good relationship was developed with the local police and their ration was put through the still twice. Pat Delaney, a dairy-farmer, used to describe the whiskey as "smooth as new milk", and other reports say it was of a high quality. The Government finally decided to stamp out the practice. They had a man who considered himself to be pretty smart - Detective Inspector Christie - and at one stage he was champion boxer and champion sculler of Victoria. He was selected as the personal bodyguard of H.R.H. Prince Alfred, the second son of Queen Victoria, on his visit to Australia. Christie was a master of disguises and seemed to enjoy being photographed in his rig-outs. He was given the task of catching Tom Delaney,. He disguised himself as a tinker and Margaret Ryan, later wife of Tom's nephew, Pat Delaney, can recall this tinker fixing pots and pans at Ryans and asking questions about the Delaneys. Christie claims to have found where the still was - in Whiskey Creek - but others say an informer gave the game away for 100 sovereigns. "Customs. I arrest you, Tom Delaney and Jim Love. Stand or I'll fire. You are my prisoners." But according to Tom Delaney, Christie shouted "We've got you, you dog, Delaney". Now what self-respecting Irishman would meekly surrender in those circumstances. Not Tom Delaney! He yelled out to Love "Come on Jim", and burst through the side of the shant into the bush with Love following and the police firing shots after them. Christie captured the still but no Tom. The order went out for Tom's arrest and he was to be outlawed. Three weeks later, Tom was driven into Warrnambool one evening by his nephew, Pat, and the next morning he gave himself up to Mr O'Callaghan, Inspector of Police in Warrnambool and later Chief Commissioner of Police. That was the end of illicit whiskey making but for many years afterwards demijohns of Delaney's whiskey were found in all sorts of places. ... The stories surrounding Delaney's whiskey are legend. One day Tom was driving a load of whiskey into Warrnambool. The police bailed him up at Allansford Bridge but as one policeman went to grab the horse's head and the other policeman climbed up the back, Tom gave the horse a cut of the whip and both police fell to the ground. A shot was fired but hit the steel stay at the back of the seat. Tom wheeled down a side track and avoided the police. He dumped the whiskey in a quarry at Lee's Wangoom, loaded the cart with cheese from a friendly farmer and drove into Warrnambool police station where he complained that he had been held up by an armed man at Allansford! Fiddler McKenzie, a quarry worker, often told the story of turning up for work on the Monday morning and finding the whiskey that Tom had dumped in the quarry. Fiddler and his mates went on a spree for a week! The police would often search the district. One day they tied their horses up and spent the day searching the bush with it's heavy undergrowth along Whiskey Creek. When they unrolled their capes from the saddles that night they found a demijohn of whiskey rolled in each cape! 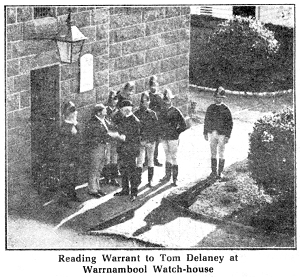 Sayers in his book on the History of the Shire of Warrnambool, says that the Delaneys "were not perhaps very industrious farmers in those early days". In fact they were very good farmers 3 but they enjoyed a bit of fun too. At about the time of the whiskey making Pat Delaney, Tom's brother, became the first to use superphosphates in the district. And the proof of the pudding is in the eating. There are now 12 families of Delaney descendants farming successfully in the district. Descendants of the Delaneys can be found throughout the Western District. They have carried on the tradition of successful farming set by their forbears. The early escapades must be seen mainly as the outcome of a spirit of adventure and a carry-over of the reaction against opressive government experienced in Ireland for 800 years. It is hard to tell which is the best kept and cultivated farm along the Nirranda road. Mr. P. Delaney, Mr Murphy and Mr. Steele have each a paddock of potatoes, and there isn't one weed to be seen in either of the crops. So much for "not perhaps very industrious farmers"!